Places Of Antique Classic Style Like church, castle, monastery, bedroom, living room, Bar, Hotel, Night Clubs, Outdoor Gardens, Villas, wedding decorations, Party, But for Better Effect of FIres, need to use Frost Glass Lamp shade and E26 Upwards Socket(like most table lamp,floor Lamps). Innovation lighting, Innovative Gifts For Kids, Men And Woman, Big Surprise at Birthday Party As Cosplay lights, Bring You To Remeber the Good Old Times When Light Up In the Lovely Evening, Creative Fire Lamps act Like Movie & Halloween Fake Fire Proops. Creative Atmosphere Mood Lamp --- For better flame flickering effective, install bulb in a frosted glass shade, lantern, salt lamp etc. The Artificial Vivid Fire, Dynamic Moving Flame, Simulate Nature Fire Flicker Flame, wonderful Replacement of Traditional Gas Lantern. High Brightness Light --- Made of high quality ABS + PC material, built in 99 sheet 3528SMD, bring you brighter light. 50000 hours lifespan. Safe & Green Energy Saving --- Excellent heat dissipation and environmental protect, no harmful substances, no UV and infrared radiation. E26 Easy to install and apply to any country. Save 90% of electricity from traditional flame bulbs, save electricity and save money. 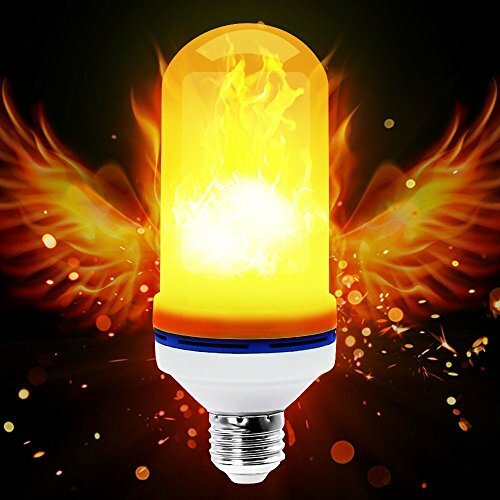 3 Modes Creative LED Flame Bulb: Live Flame Emulation Mode, Breathing Mode and General Lighting Mode can easily changed by your Turn-ON-OFF Button.